It’s almost Valentine’s Day again, and for those who prefer having a cozy dinner with their loved one at home than experiencing the nightmare of dining out on Valentine’s Day, there’s nothing better to finish a lovely home cooked meal than a serving of the Italian classic, Tiramisu. 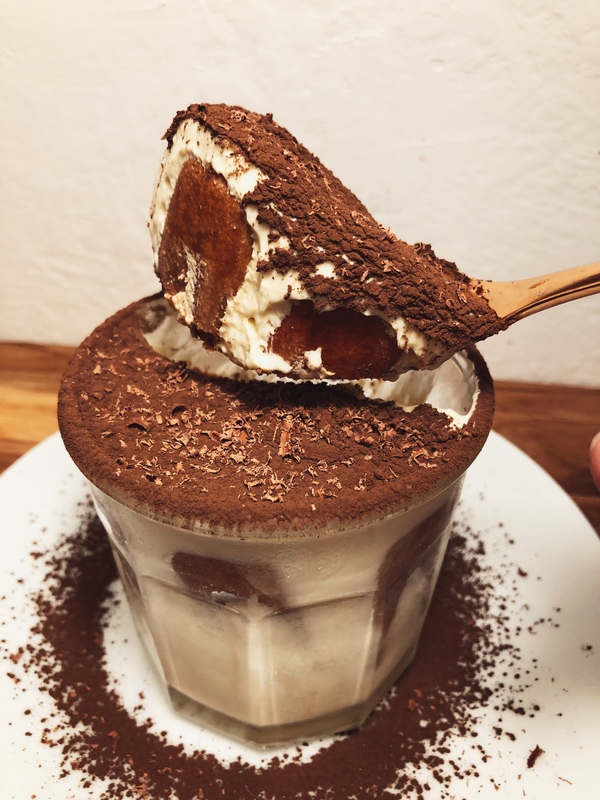 It’s rich and creamy, but light and refreshing, the liquor might get you a little tipsy, but the espresso will pick you right up, that’s why tiramisù means “cheer me up” or “lift me up”. For a dessert this delicious, most are afraid the recipe would be too hard, and if you look around on the internet or a lot of the cookbooks, many recipes want you to make a double boiler to cook egg yolks or make the filling using the same technic as a mouse. Yes, using these technics does make the texture a little bit better, but it just seems too unnecessarily complicated. So, here is an easier and more traditional way to make this beloved desert! It takes about 15 min and makes about 2 servings, you can use a stemless wine glass or a rock glass which fits about 1 serving. Take all the ingredients out of the fridge and place them on your kitchen counter so that they reach room temperature, this will make the whipping much easier. In another large bowl, whip the egg white & the rest of the sugar until they form a stiff peak, if the egg white is at room temperature, this will only take about 3 min of whipping. Dust the top with cocoa powder, then sprinkle with some shaved chocolate and enjoy!